Persimmons. Do you like them? 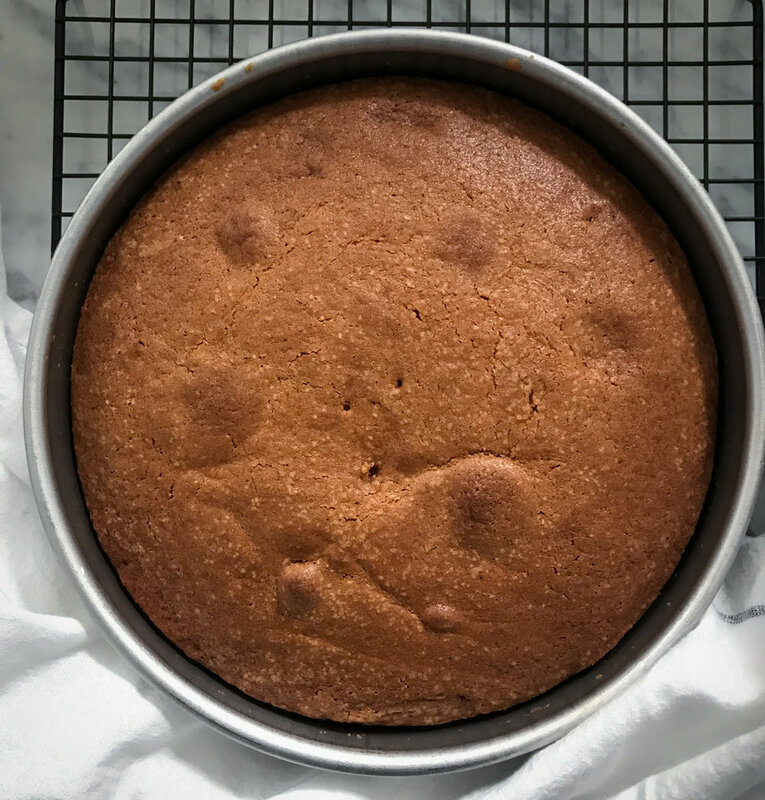 I love a good persimmon and I love a good cake. 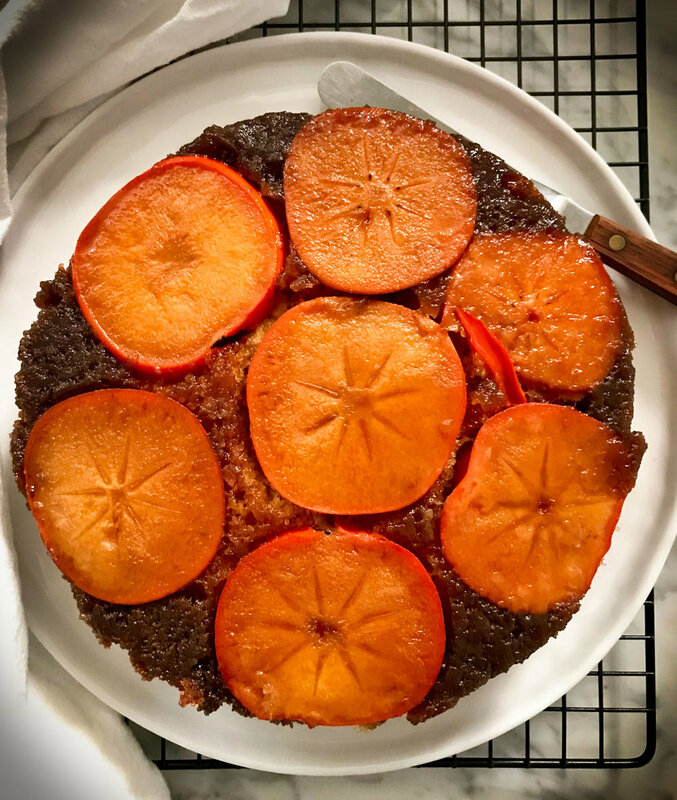 So with persimmon season upon us, I cooked up a good old fashioned upside down cake. This recipe found its inspiration in a 1940's Good Housekeeping Cookbook that I have had around for a while. I regularly thumb through this old gem reading the recipes and kitchen tips like they are chapters in a novel. By the looks of the cookbook, many other hands have turned its pages. For me, old ways and attitudes toward food seem like a trip to a distant mythical place. Before getting to the recipe, I have to confess about a little problem I might have. I don't really think of it as a problem but maybe....... I am Carrie and I like finding free food. There, it is out! Don't be alarmed if you see me scanning your yard, farm, garden, looking for anything extra. Some people get the same thrill out of finding the last pair of super sale shoes in their size. Keep the shoes but can I have your extra....... persimmons? Something like that happened here. I was at my father-in-law's house and noticed a big pile of orange fruit on the counter. You know the rest - a bag of persimmons came home with me and a plate of upside down cake will go back to Jack, my father-in-law. We are all happy because Jack loves nothing better than homemade cake. You see, all is right in the world. Melted butter and brown sugar in the bottom of the pan - yum! Layer on the sliced persimmons and pour on the batter. After 35 minutes in the oven you have a gooey fruit topped caked. Whipped cream or ice cream? Me, I am a whipped cream girl all the way! Heat oven to 350 degrees. Melt butter in an 8 inch greased cake pan. 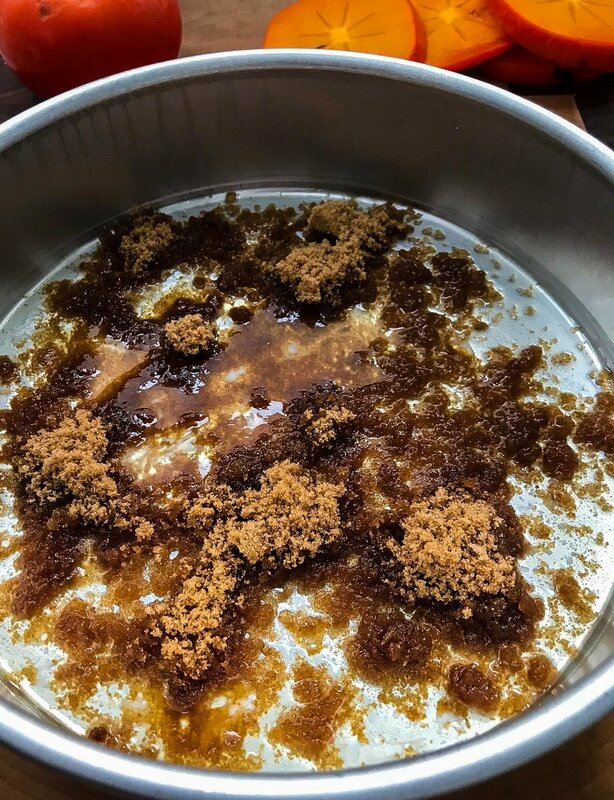 Sprinkle in brown sugar. Arrange persimmon slices on top of sugar. Combine flour, baking soda and salt in a small bowl. Cream together butter and sugar until fluffy. Add egg and vanilla into butter and sugar and mix until well blended. Alternate adding dry ingredients and buttermilk in thirds. Mix until combined and pour into cake pan. Bake for 35 minutes or until cake tester comes out clean. Remove from oven and cool on rack for about 5 minutes. Invert pan onto your serving plate. Lift off pan. If any fruit sticks to the bottom, remove and place on top of inverted cake.